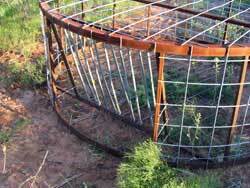 "Hunting, trapping, and cooking wild hog"
A novel and very useful animal trap is the round hog trap design. 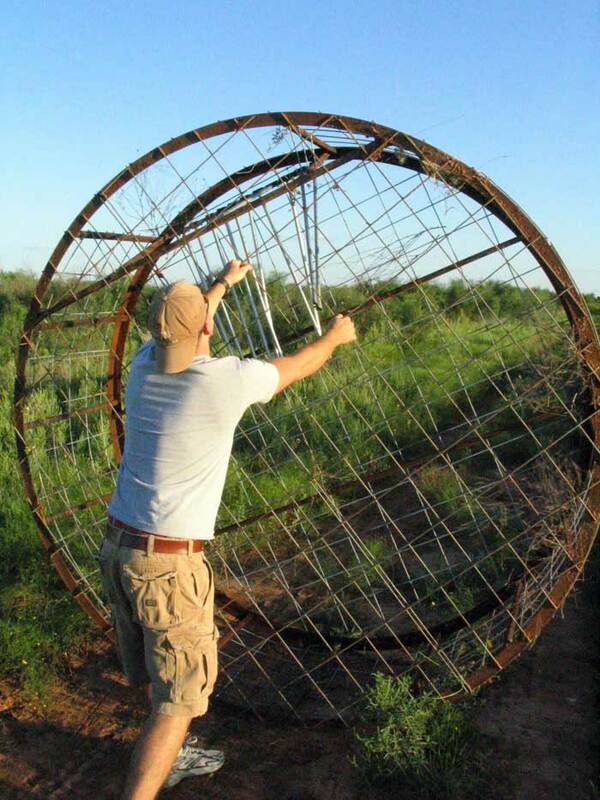 Its function is the same — to catch hogs — but the real beauty is the ease of moving a rolling hog trap around the ranch. 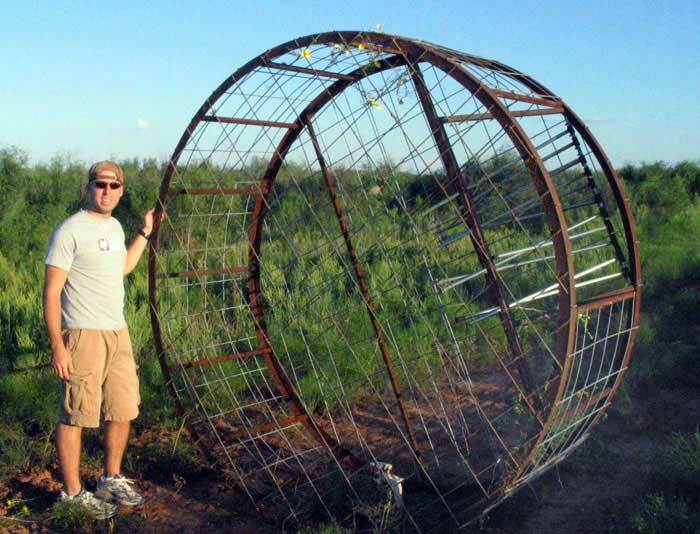 Building the round trap is definitely more involved and expensive than building a traditional rectangular trap, but if you are serious about portability, it can't be beat. 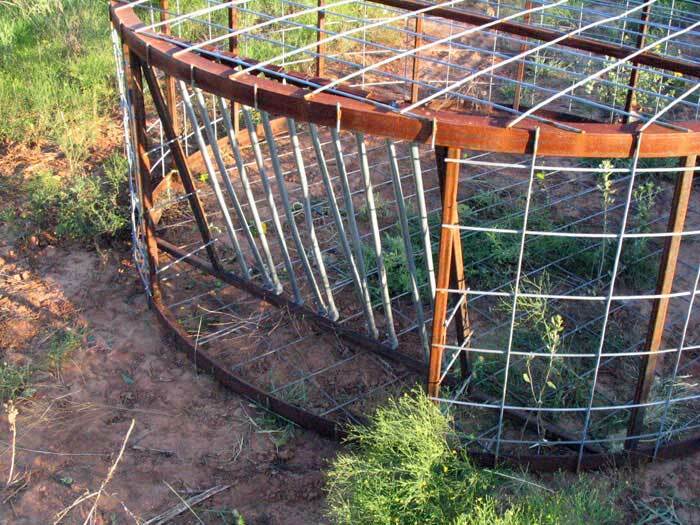 The round hog trap can be rolled to the rear of your truck, and then rolled right in. You drive to the ranch, and roll it out. And when you want to move it, roll it right over to the new area. The first thing to solve when building this design is to take your material to a metal shop and have it professionally bent. Angle iron will warp out of straight shape, so it's best to use at least 3-4 pieces to make up the circular shape. These will then be welded together to form the circle. 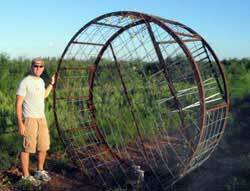 Your other option for this design is to make the trap an octagon shape, rather than a perfect circle. 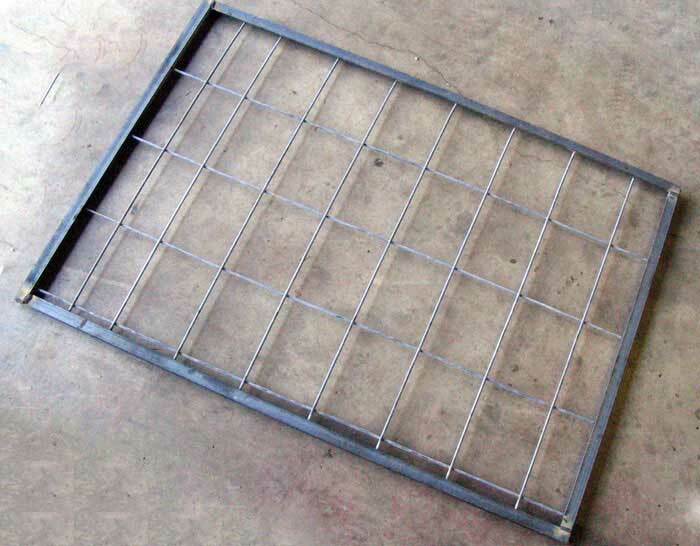 When you get your material back, you will need to work with it to get it welded together. Lay the bent pieces on flat ground and get a feel for how much warpage you're dealing with. Then it's just a matter of mind over matter getting them welded into shape. If you have access to a Oxy/Acetylene torch, you'll be able to heat and bend the material with ease to get it in to shape. If not, enlist help and use those muscles! After both top and bottom circle sections have been put together start putting the upright sections in. Working on the lower section, tack in at least 6 uprights. With help, place the top section on top. You'll likely have to muscle the uprights into place. Finish weld these when you're satisfied that the frame is square and straight. With this style frame, a swing door is still a possibility, but because we prefer this style to be shorter, we used a root style (top hinge) door. See Fig. 2. Make the door at least 30" wide and slightly taller than the frame's height, so that it will sit at an angle when closed. After you've made the door, put it in the frame and make measurements as to where you would like to see the top hinge framing member. Weld this top bracket across the top of the frame. Next weld your hinges to the door, and then the hinges to the framing member. Where the door hits the bottom of the trap, weld a door jamb framing member. We were very concerned about the weight of the door making it unattractive for pigs to enter, so the material was very light piping. We initially (Fig. 2) hinged these individually by welding the pipe to a horizontal piece of pipe that hinged on a solid rod. They were not connected at the bottom. This design proven inadequate. Because the rods were not connected at the bottom, they were able to be bent and bashed open. Therefore, we suggest that you make the door like the one in Fig. 3 that is solid and hinged with heavy-duty hinges. Forum: Find solutions, share recipes, talk trapping!